Neonicotinoids are inflicting mass suffering and death on honeybees worldwide. Close to half of the United States bee population has disappeared in the last decade. Honeybees are still suffering and dying at an alarming and unsustainable rate, and at a rate deemed "too high for their long-term survival" according to a study published last year. Furthermore, a Harvard study released the same month points specifically to the neonictinoids group of pesticides, better known as neonics, as the definitive culprit in the honeybees' precipitous and chronic decline. Continued use of this deadly pesticide will poison the honeybee into extinction and we must take action individually and as a nation to demand an end to their use. 1) Please make a call to as many of the leading suppliers of neonicotinoids as you can, urging them to end their sale of the pesticide. The honeybee population decline has now reached a rate too high for the species' long-term survival. A new Harvard study found neonicotinoids responsible for the declining bee population and Colony Collapse Disorder. Neonicotinoids attacks honeybees' nervous system, disrupting foraging behavior, communication, homing ability and larval development. Harvard's study identified neonicotinoids as the cause behind Colony Collapse Disorder. First recorded in 2006, this phenomenon continues to devastate bee communities as members of the colony suddenly vanish, their bodies scarcely found. In the last decade, nearly half of the United Sates bee population has disappeared, according to the New York Times. As a foraging species, honeybees depend on their complex memory to constantly locate food sources by associating specific flowers with an equally specific smell or color, learning its location for future use. Neonicotinoids distorts this vital foraging ability by attacking a bee's central nervous system. Furthermore, this severe nerve damage inevitably leads to blocked communication abilities, lingering paralysis and a painful death. Due to the honeybees' highly complex learning memory and social communication system, their species remains extremely vulnerable to neonicotinoids when compared to other insects. In addition, honeybees' posses fewer detoxifying genes responsible for counteracting the pesticide. Left defenseless, exposure to neonicotinoids creates a higher risk for parasites, disease and infection as the poison weakens bees' immune system. Likewise, exposed larvae show disrupted development including impaired learning abilities, which are vital for their survival. 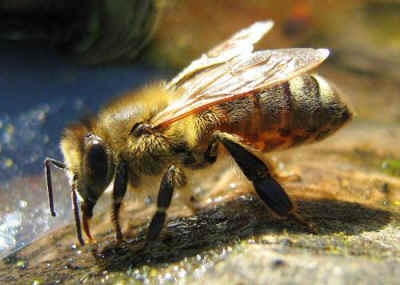 Studies also show that honeybees are fatally addicted to neonicotinoids, which contains nicotine. Neonicotinoids harms other species including butterflies, moths, birds and bats. In addition to the European Union banning three neonicotinoids; imidacloprid, thaimethoxam and clothianidin, a few companies in the United States have taken steps towards the poisonous problem. Among others, Lowe’s has announced its decision to phase out the sale of plants laced with neonicotinoids while Home Depot has agreed to label neonicotinoid treated products. It is vital to the honeybee's survival that the use of neonicotinoids is banned worldwide, and companies must cease the sale of these deadly chemicals. As honeybees continue to suffer and die due to the devastating effects of neonicotinoids, their colonies continue to disappear. Please help honeybees by opposing the use of neonicotinoids!